Bernie has to come out firing versus Nadal. MELBOURNE – Juan Martin del Potro blew out Bernard Tomic in the Sydney final, which is an indication that if he is actually fit enough to contest numerous three-of-five set matches that he might have chance to win another major. As the only active guy in his mid-20s outside of the super elite group Rafael Nadal, Novak Djokovic, Andy Murray and Roger Federer to win a major, the Argentine is frequently talked about as the most obvious choice to transform the Big 4 into a Big 5. But since he came back from wrist surgery in 2010, Del Potro has not shown himself to be consistent enough at the big tournaments to win a Slam, or even a Masters Series. Yes, he has scored wins over all of the Big 4 during that time period, and he also has a forceful enough serve, and a gigantic forehand to be able to nullify every type of foe. But is he really good enough to win the Australian Open and eventually grab the No. 1 ranking? The jury is still out. No. 1 Nadal stands of top of the quarter, which includes two of the most talented youngsters on tour, Milos Raonic and Grigor Dimitrov. Those two are in Del Potro’s segment of 16 and he could face one of them in the fourth round. But first he has to get past the US qualifier Rhyne Williams, possibly the US third-highest ranked player in Tim Smyczek, and maybe the talented 27th seed Benoit Paire. If he punches past Raonic or Dimitrov and reaches the quarters, he will more than likely have to confront Nadal, assuming the Spaniard bests Tomic in the first round, possibly No. 25 Gael Monfils in the third round (whom the Spaniard took down in the Doha final) and possibly an in-form Lleyton Hewitt or Japan’s Kei Nishikori in the fourth round. Tomic believes that if he comes on the court with the right attitude, that he will have a shot of upsetting Nadal. Perhaps the 21-year-old Aussie can shock the tennis world and take down the world No. 1, but he is going to have come out red-hot and take it to Nadal early and often. If the contest goes past three hours, it’s very hard to see him wearing the Spaniard down. As Hewitt says, Nadal likes very physical contests and the veteran Aussie does not like his Davis Cup teammate’s chances in a five-setter. 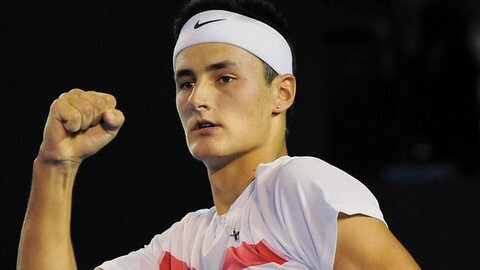 Tomic;s first serve has improved, as has his forehand, but his strength is in his variety, not in throwing his opponents through a wall with a power surge, like Jo Wilfried Tsonga did to Nadal back in the 2008 Aussie Open semis, or DelPo did to Nadal in the 2009 US Open semis. Tomic would have to mix up his attack perfectly and win the match in three of four sets, which is unlikely give how high Nadal’s level has been since he returned to play last February. But if Tomic can’t pull off the feat, maybe Del Potro can in the quarterfinals. The Australian believes in the Tower of Tandil, thinking he might sky above the Quarter of Death. Jordan Thompson (Australia) v 20-Jerzy Janowicz (Poland): Is the young Aussie ready to upset the young, talented yet rusty Pole? Sam Groth (Australia) v 28-Vasek Pospisil (Canada): Does the big serving Australian have a good enough all-court game to stop the rising Pospisil, who is contending with back trouble? 17-Samantha Stosur (Australia) v Klara Zakopalova (Czech Republic): Can the Australia avoid what happened to her last year, losing to the same player in consecutive weeks (Zakopalova bested Stosur in Hobart last week, and in 2013 Stosur lost to Zheng Jie at Sydney and the Aussie Open)? 22-Ekaterina Makarova (Russia) v Venus Williams (U.S.): Makarova knocked off Venus’s sister, Serena, two years ago in Melbourne and now takes aim at Venus, who is coming off a terrific run to the Auckland final but can be a slow starter.